I’m a sucker for a good piece of fish. When I received my latest issue of Cooking Light and saw Crispy Fish with Lemon-Dill Sauce I knew that I had to make it right away. I changed a few things about it–especially the sauce. That’s why I changed it’s name. The title didn’t lie. It’s crispy. Really crispy. And that’s a good thing. I chose to make this dish with Cod but you could also use flounder, bass, tilapia etc… It cooks fast and is a really simple dish to put together-great for a fast weeknight meal or, in my case, a great dinner after a busy Saturday of running around. Place egg white in a shallow dish. In a 2nd dish combine panko and next 3 ingredients and mix to combine. Spray a broiler pan with cooking spray. 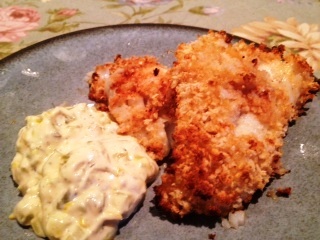 Sprinkle salt and pepper onto both sides of fish then dip each fillet in the egg and then roll in panko to coat evenly. Place fillets on the prepared broiler pan and broil 4 minutes on each side or until cooked through. Time will depend on fillet size. While fish is cooking prepare the sauce. Combine the last 4 ingredients in the list above in a small bow, stir and serve on the side with the fish. This fish is very light but incredibly flavorful. Tilapia is so mild and the slight nutty tang from the cheese really does perk it up a bit. 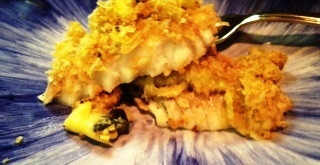 Paired with the artichoke hearts, breadcrumbs and lemon it’s a perfect combination of flavors for the fish. This recipe comes together so fast and the prep time is a short-only about 5 minutes. The fish will be on the table 20 minutes later. Conveniently you can also roast vegetables at the same time and have everything finish cooking at the same time. Pre-heat oven to 375. Line a baking dish just large enough to hold the fish with parchment paper and give it a bit of non-stick spray or olive oil. Wash the fish, pat them dry and sprinkle salt and pepper on both sides then place them into the baking dish. Combine the artichoke hearts, breadcrumbs, parmesan and lemon juice in a small bowl and stir to combine. Spoon half of the artichoke mixture over each piece of fish. Bake in the oven for 15-20 minutes or until fish is cooked thoroughly. Recently I’ve had it in my head that I need to eat more fish at home. Seeing as though I live on an island with an abundance of fantastic fresh fish available it shouldn’t be too much of a challenge. 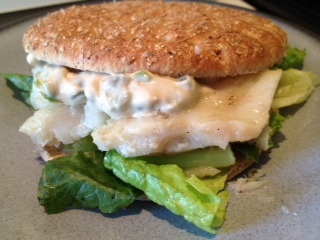 I used Chilean Sea Bass for this sandwich but you could also use cod, grouper or any other white flaky fish. Keeping with that thought I decided to make this sandwich and it was so fantastic!! Light, flaky fish and tangy, zesty tartar sauce. It wasn’t too big or too small-just right. These sandwiches came together in no time. While the fish is cooking you prepare the sauce. Pre-heat a stove top grill pan to medium heat (you can also use an outdoor grill). Drizzle fish with olive oil on all sides and then season with salt and pepper. Place fish on the grill and cook for about 3 minutes on each side (depending on the size of the fish) until fish flakes easily with a fork. Place fish, lettuce and tartar sauce (recipe below) on a bun and enjoy. Mix all ingredients in a bowl and set aside to use right away or refrigerate until later. Makes just over 1/4 cup of sauce. Both recipies adapted from Cooking Light Fresh Food Fast cookbook. I love fresh fish and am fortunate enough to live on Long Island where it abounds. I don’t cook it enough and really should cook it more often. Fresh cod was on sale at my supermarket this week and I remembered that I had bookmarked a recipe from Gina over at skinnytaste that would work perfectly with cod or tilaipa or any white flaky fish or shrimp too. What a delicious easy recipe! I think next time I will add some white wine and then throw the fish under the broiler when it’s almost done cooking but this recipe is a keeper. So go get yourself some delicious fish and make it tonight!! I served the celery root and mandarin orange salad along with the fish. Melt butter on a low flame in a small sauce pan. Add garlic and saute on low for about 1 minute. Add the lemon juice and shut off flame. Spray the bottom of a baking dish lightly with cooking spray. Place the fish on top and season with salt and pepper. Pour the lemon butter mixture on the fish and top with fresh parsley. Bake at 400° until cooked, about 15-20 minutes depending on the thickness of the fish.